LOVE YOUR CAR! LOVE YOUR MECHANIC! SPRING IS STILL STRUGGLING to find us, but it’s just about here. The town is becoming a little livelier every day. Last Friday evening the scene at the Railyard art galleries was a blast with lots of great art and art lovers. It wasn’t quite as busy as the summer, but it was a great start to the upcoming season. Watch our pages, as we will be seeing a lot more gallery openings and events now and through the summer. The music scene has a new addition. Tesuque Casino, just north of Santa Fe and well before you get to Buffalo Thunder, is starting to book some fun entertainment. Between our local casinos and the ones further south, we have more and more venues for music. I was pleased to note that Tesuque Casino offers late night entertainment in a place not known for late night anything. This is good. I promise the weather will warm and you will want to dig in the dirt, getting your garden into gear. Watch the pages of NOW, as there are often events related to gardening. We are blessed to have experts in high desert gardening available who can help make any thumb a bit greener. Savor these first warm days of spring. We’ve waited patiently and they’re finally here. 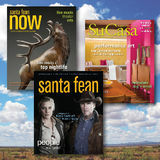 SantaFeanNOW.com Read every issue right now, for FREE! Cipriano Vigil is a regular performer at the annual Nuestra Música concert. Meet and greet local artists, writers, and self-publishers at the third annual Santa Fe Zine Fest. Recently, Santa Fe was voted Travel + Leisure Magazine’s Reader’s Choice Destination of the Year, and our city consistently ranks as one of the best travel destinations in the world due to the abundance of high-quality art, shopping, historic attractions, outdoor adventure, and food and entertainment offerings. Santa Fean NOW is an excellent hands-on source of information for all that’s happening around town, and in these pages you will find the listings you need to navigate hundreds of weekly events. To make the most of your time in Santa Fe, please stop by one of our Visitor Centers: Downtown on the Santa Fe Plaza, at the Santa Fe Railyard, or inside the Community Convention Center. Our knowledgeable staff will provide you with insider tips and activity suggestions customized to your interests, as well as maps and materials to use during your stay. Download the Santa Fe Margarita Trail App or buy a printed passport at one of the 31 participating stops on the trail. Start collecting stamps as you taste the finest variations of this beloved cocktail, which pairs delightfully with our signature New Mexican cuisine. 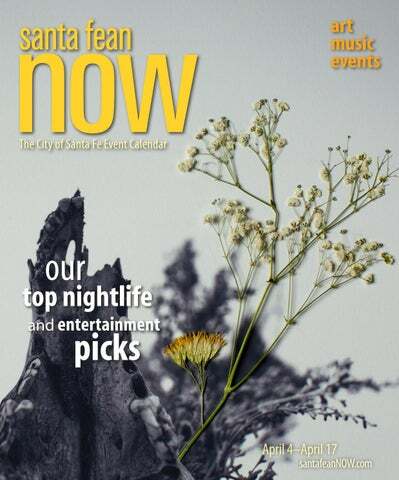 There is always something going on in Santa Fe, so use this copy of NOW to find a gallery opening, music performance, museum exhibit, festival, or market to add to your itinerary. Have a wonderful time in The City Different! Pacheco Park, 1512 Pacheco St, Ste D-105 Santa Fe, NM 87505 Telephone 505-983-1444 info@santafean.com santafeanNOW.com Copyright 2019. Reproduction in whole or in part without permission is prohibited. Santa Fean NOW Volume 6, Number 7 Week of April 4, 2019. Published by Bella Media, LLC, at Pacheco Park, 1512 Pacheco St, Ste D-105, Santa Fe, NM 87505, USA, 505-983-1444 © Copyright 2014-2019 by Bella Media, LLC. All rights reserved. On the cover: Chelsea Call is among artists bringing mementos of the spring season, such as pressed flowers, to Dandelion Guild on April 12. Gregory Horndeski explores spring in his show Vernal Paintings at Horndeski Contemporary. The New Mexico School for the Arts presents an evening of performance featuring new, experimental, and collaborative student work that aims to push the boundaries of art making. Free, 6–8 pm, 505-216-1256, nmschoolforthearts.org. Join Maktima (San Felipe/Laguna/Hopi) in a demonstration in the art of tying flies for fishing. $5, 1–2:30 pm, 505-428-5907, iaia.edu. Guitarist, singer, and songwriter. Free, 6–9 pm, 800-462-2635, tesuquecasino.com. Broadway, contemporary, and pop selections. Free, 6:30–9:30 pm, 505-982-9966, vanessiesantafe.com. A pub trivia quiz covering everything from celebrities in trouble to wordplay to bad television. Free, 7–9 pm, 505-424-3333, santafebrewing.com. Matt Rudder Inn and Spa at Loretto, 211 Old Santa Fe Trl A guitarist in The Living Room. Free, 7–10 pm, 505-988-5531, hotelloretto.com. Lois Stark is an Emmy Award-winning writer and producer of documentary films. In this lecture, she presents the concept of “shape” in a tour through time from migratory tribes to the modern era, tracing how the very shape of human shelters, social systems, and sacred sites reveals a mental map of an era. $15, 1–3 pm, 505-982-9274, renesan.org. In his new work, former Santa Fe Poet Laureate Arthur Sze employs a wide range of voices. Free, 6 pm, 505-988-4226, collectedworksbookstore.com. Flatbed Buggy is comprised of some of the most respected musicians and composers on the New York scene—Rudy Royston on drums, Gary Versace on accordion, John Ellis on bass clarinet and saxes, Joe Martin on bass, and Hank Roberts on cello. $22, 7:30 pm, 505-886-1251, gigsantafe.tickit.ca. Music by Bach, Schmelzer, Albinoni, and more. Free, 5:30 pm, 505-982-8544, fpcsantafe.org. Hits from the ‘60s and ‘70s. Free, 7:30–11 pm, 505-982-5511, lafondasantafe.com. Swing and jazz. Free, 7–10 pm, 505-982-3030, secondstreetbrewery.com. Contemporary and indie folk in The Living Room. Free, 7–10 pm, 505-988-5531, hotelloretto.com. Santa Fe’s swinging jazz piano trio plays El Mesón with special guest musicians each Friday night. Free, 7:30–10:30 pm, 505-983-6756, elmeson-santafe.com. Iron Chiwawa Mine Shaft Tavern, 2846 NM-14, Madrid Rock ‘n’ roll. Free, 8 pm, 505-473-0743, themineshafttavern.com. California Guitar Trio, playing St. Francis Auditorium on April 11, crisscrosses genres to explore and evolve the repertoire. A flamenco dinner show—dinner reservations required. $25, 6:30 pm, 505-983-9912, elfarolsantafe.com. Jeremy Thomas: Structural Consciousness Charlotte Jackson Fine Art 554 South Guadalupe (See page 14.) Free, 5–7 pm, 505-989-8688, charlottejackson.com. An evening of cocktails and hors d’oeuvres with a live auction to benefit the museum’s exhibitions programs. $40, 4:30 pm, 505-982-2226, spanishcolonial.org. Photographs, paintings, and writings tell the stories of several groups who made repeated visits to the area known as Glen Canyon on the Colorado River, Glen Canyon Dam, and the resultant Lake Powell. With museum admission, 5–7 pm, 505-476-5072, nmartmuseum.org. (See page 14.) Free, 5–7 pm, 505-988-0550, adobegallery.com. (See page 13.) Free, 5–7 pm, 505-437-1107, 7arts.gallery. ViVO Contemporary artists are collaborating with a group of New Mexico poets to give poetic voice to artistic image. Free, 5:30 pm, 505-982-1320, vivocontemporary.com. The second in a series of monthly exhibits of paintings and photographs by clients of Dino’s Drive-In Barber Shop features photographs by Steven Linam. Beer and wine will be served. Free, 6 pm, 505-908-0902, dinosdriveinbarbershop.com. Blues and rock. Free, 5 pm, 505-471-9271, beercreekbrew.com. Los Angeles–based pianist-vocalist who does standards, Broadway, contemporary, and pop selections. Free, 6:30–9:30 pm, 505-982-9966, vanessiesantafe.com. Native American flute and Spanish classical guitar music from Ronald Roybal each Friday and Saturday. Free, 7–9 pm, 855-825-9876, hotelsantafe.com, ronaldroybal.com. Guitarist, singer, and songwriter. Free, 7–10 pm, 505-982-3433, labocasantafe.com. An eclectic blend of alt-country mixed with a smattering of soul and rock. Free, 8–11 pm, 505-780-5730, tumblerootbreweryanddistillery.com. Little Leroy and His Pack of Lies La Fonda on the Plaza, 100 E San Francisco Rock 'n’ roll. Free, 8–11 pm, 505-982-5511, lafondasantafe.com. Southwestern outlaw rock. Free, 9–11 pm, 505-780-5730, elfarolsantafe.com. Dance and electronic music. The guest acts include Bowra, Gaud Tonic, James Black, and more. $18–$22, 9 pm–2 am, ages 21+, 505-395-6369, meowwolf.com. Classic soul and R&B. Free, 10 pm–1 am, 800-462-2635, tesuquecasino.com. Enjoy a hike into the Santa Fe River Canyon, one of the area’s lesser-known jewels. The canyon lies just west of La Cienega and features a year-round river due to the many springs in the area. $7, 10 am–12 pm, 505-471-9103, santafebotanicalgarden.org. The stand-up comedian has three specials on Netflix. $35–$75, 7 pm, 505-988-1234, ticketssantafe.org. and offers the experience of deep periods of uninterrupted meditation. Meditation instruction is offered to beginners. $50, meals included, 6 am–9 pm, 505-986-8518, upaya.org. Create a piece of art and have fun with the simple medium of wax. $145, noon-4 pm, 505-989-3283, eainm.com. Saturday Jazz Collected Works Bookstore & Coffeehouse 202 Galisteo Jeremy Thomas's inflated steel sculptures show at Charlotte Jackson Fine Art. Santa Fe’s best in pottery, jewelry, paintings, photography, sculpture, furniture, textiles, and more. Featuring local juried artists. Free, 8 am–2 pm, 505-310-8766, santafeartistsmarket.com. A weekly market offering folk and tribal art, antiques, jewelry, and much more. Held each Saturday and Sunday across the tracks from the Farmers Market. Free, 8 am–3 pm, 505-250-8969, elmuseocultural.org. The Taos Chamber Music Group celebrates the contributions of Chilton Anderson, founder of the Taos School of Music. $25, 5:30 pm, 575-770-1167, taoschambermusicgroup.org. (See page 1.) $10, free for seniors, 6:30 pm, 505-988-1234, ticketssantafe.org. Original electronic and acoustic compositions. $10–$15, 8 pm, 505-577-5248, earwaves.net. Fresh produce and handmade goods from local vendors. Free, 8 am–1 pm, 505-983-4098, santafefarmersmarket.com. PAZ: Nature and Culture Eye on the Mountain Gallery, 614 Agua Fria (See page 14.) Free, 5–9 pm, 505-308-0319, eyeonthemountaingallery.com. Learn proper rose pruning techniques in this hands-on workshop presented by professional rosarian Katherine O’Brien. Free, 10 am–noon, 505-316-3596, railyardpark.org. Function Santa Fe Clay, 545 Camino de la Familia (See page 1.) $10–$25, 2 and 4 pm sessions, 505-983-6372, santafeclay.com. Utilizing the House of Eternal Return and the David Loughridge Learning Center, participants will be invited to embody the four major archetypes of the outer planets. $60, 10 am–4 pm, 505-395-6369, santafe.meowwolf.com. Celebrating Santa Fe Community Yoga’s recent expansion into a second yoga studio, this open house will offer free sample yoga classes and a silent raffle. Free, 2–6 pm, 505-820-9363, santafecommunityyoga.org. Iconik Downtown presents jazz in the café area. Free, 11 am–1:30 pm, 505-988-4226, collectedworksbookstore.com. Alternative and new country. Free, 5–8:30 pm, 800-462-2635, tesuquecasino.com. Americana and folk. Free, 5:30 pm, 505-471-9271, beercreekbrew.com. Santa Fe-based folk singer-songwriter David Berkeley presents a special benefit concert. $15, 7–8:30 pm, 505-982-1376, sftbs.org. The Barbwires Second Street Brewery, 1814 Second St Blues band. Free, 7–10 pm, 505-982-3030, secondstreetbrewery.com. Melodic jazz guitarist in The Living Room. Free, 7–10 pm, 505-988-5531, hotelloretto.com. Jazz vocalist Jasmine Williams with Tom Rheam on trumpet and piano, Lee Steck on drums, and Jack Hanan on bass. Free, 7:30–10:30 pm, 505-983-6756, elmeson-santafe.com. A weekly market offering folk and tribal art, antiques, jewelry, and much more. Held each Saturday and Sunday across the tracks from the Farmers Market. Free, 9 am–4 pm, 505-250-8969, elmuseocultural.org. Railyard Artisan Market Farmers Market Pavilion, 1607 Paseo de Peralta David Berkeley plays acoustic music, Americana, and folk at Temple Beth Shalom on April 6. The Jakes Mine Shaft Tavern, 2846 NM-14, Madrid Southern rock. Free, 8 pm, 505-473-0743, themineshafttavern.com. Little Leroy and His Pack of Lies La Fonda on the Plaza, 100 E San Francisco Rock ‘n’ roll. Free, 8–11 pm, 505-982-5511, lafondasantafe.com. Country singer-songwriter. Free, 8–11 pm, 505-780-5730, tumblerootbreweryanddistillery.com. Karaoke night hosted by Nanci and Cyndy. Free, 8:30 pm–12:30 am, 505-983-9817, tinyssantafe.com. Rock and blues. Free, 9–11 pm, 505-780-5730, elfarolsantafe.com. Dubstep, drumstep, and electro house. The guest acts include Bowra, Gaud Tonic, James Black, and more. $22–$25, 9 pm–2 am, ages 18+, 505-395-6369, meowwolf.com. Covers from the ‘70s to the ‘90s and a few originals. Free, 10 pm–1 am, 800-462-2635, tesuquecasino.com. Robert Marcum La Fonda on the Plaza, 100 E San Francisco Singer, songwriter, and guitarist. Free, 6–8:30 pm, 505-982-5511, lafondasantafe.com. Latin music in many forms. Free, 6–8 pm, 505-982-3433, labocasantafe.com. Classic jazz. $5, 7–9 pm, 505-780-5730, tumblerootbreweryanddistillery.com. Local art, photography, jewelry, ceramics, glasswork, textiles, food, live music, and more every Sunday at the Railyard. Free, 10 am–4 pm, 505-983-4098, artmarketsantafe.com. An art therapy inspired workshop cultivating self-care at the David Loughridge Learning Center. $15, ages 18+, 5:30–7:30 pm, 505-395-6369, meowwolf.com. Santa Fe Community Orchestra Spring Concert James A. Little Theater, 1060 Cerrillos The Santa Fe Community Orchestra presents works by Tchaikovsky, Mozart, and Britten. Free, 2:30 pm, 505-466-4879, sfco.org. Trumpeter Chief Sanchez plays with the duo. Free, 6–9 pm, 800-462-2635, tesuquecasino.com. Classical, Broadway, and piano standards. Free, 6:30–9:30 pm, 505-982-9966, vanessiesantafe.com. This is an opportunity for those new to Upaya to get acquainted and receive instruction on Zen meditation and temple etiquette. Free, 3–4 pm, 505-986-8518, upaya.org. Chant a liturgy calling out to all who are lost and hungry, including the self. Free, 5:30–6:30 pm, 505-986-8518, upaya.org. Old favorite folk songs. Free, 2:30 pm, 505-471-9271, beercreekbrew.com. Singer-songwriter. Free, 5:30 pm, 505-471-9271, beercreekbrew.com. A pub trivia quiz covering everything from celebrities in trouble to wordplay to bad television. Free, 7 pm, 505-983-6443, draft-station.com. Elements of progressive bluegrass, folk, rock, country, jazz, and more. $25–$30, 7–10:30 pm, ages 21+, 505-395-6369, meowwolf.com. A weekly swing dance with a preceding class. $8 ($3 without class), class 7 pm, dance 8–9:30 pm, santafeswing.com. Afro-Latin rhythms, blue notes, rock attitude, and flamenco spirit. $15–$20, 7:30–9:30 pm, all ages, 505-886-1251, ampconcerts.org. The book of the month for April is Mesquite: An Arboreal Love Affair by Gary Paul Nabhan. Free, 1–2:30 pm, 505-471-9103, santafebotanicalgarden.org. Come paint in a group, instruction provided. $55 + $10 materials fee (or bring your own), 1:30–4:30 pm, 505-428-9469, artworkshopsinsantafe.com. The poets read from their books, Not into the Blossoms and Not into the Air and Hawk Parable, respectively. Free, 6 pm, 505-988-4226, collectedworksbookstore.com. TUESDAY April 9 Learning + Workshops Function Santa Fe Clay, 545 Camino de la Familia (See page 1.) $10–$25, 5 and 7 pm sessions, 505-983-6372, santafeclay.com. Community Science Training Railyard Park Community Room, 701 Callejon Join presenters from Rio Grande Phenology Trail for a training on observing Railyard Park’s plants. Free, 10 am–noon, 505-316-3596, railyardpark.org. Minimalist guitar pop. $19–$21, 7–11 pm, all ages, 505-395-6369, meowwolf.com. A weekly Argentine tango dance event. $5, 7:30–11 pm, 505-983-6756, elmeson-santafe.com. Dharma Talk by Sensei Joshin Byrnes and Sensei Genzan Quennell Upaya Zen Center, 1404 Cerro Gordo Nina Glaser’s Foodie will be one of the works given poetic voice at ViVO on April 5. A pub trivia quiz covering everything from celebrities in trouble to wordplay to bad television. Free, 8 pm, 505-988-7222, boxcarsantafe.com. El Farol’s longtime blues outfit jams out each Tuesday. $5, 8:30 pm–12 am, 505-983-9912, elfarolsantafe.com. Ambassador Vicki Huddleston’s lecture provides an overview of US-Cuban relations from the Bay of Pigs to President Trump’s reversal of the Obama-Castro opening and includes personal stories of how she managed relations with Fidel Castro during a period of high tensions. $15, 1–3 pm, 505-982-9274, renesan.org. New York Times bestselling author Anne Hillerman brings together modern mystery, Navajo traditions, and the evocative landscape of the desert Southwest in this intriguing entry in her Leaphorn, Chee, and Manuelito series. $30, including a copy of the book, 6 pm, 505-988-4226, collectedworksbookstore.com. Zakir Hussain and the Masters of Percussion Lensic Performing Arts Center 211 W San Francisco A percussion supergroup exploring new and old musical traditions. $35–$69, 7:30 pm, 505-988-1234, ticketssantafe.org. This talk is by Sensei Joshin Byrnes and Sensei Genzan Quennell. The talk is on the theme of stories from the Lotus Sutra. The evening begins with a 15-minute meditation. Free, donations invited, 5:30–6:30 pm, 505-986-8518, upaya.org. Art therapy students Bryan Ko and Blake Van Egeren co-facilitate this adult group art therapy-inspired process. The group will focus on engaging participants in exploring their creative energy and its ability to transform their relationship to self, others, and the environment. $35, 6–8 pm, 505-395-6369, meowwolf.com. Singer and guitarist. Free, 6–9 pm, 800-462-2635, tesuquecasino.com. Los Angeles–based pianist-vocalist who does standards, Broadway, contemporary and pop selections. Free, 6–8 pm, 505-982-9966, vanessiesantafe.com. Flamenco and classical guitar. Free, 7–9 pm, 505-983-6756, elmeson-santafe.com. Sierra La Fonda on the Plaza, 100 E San Francisco Country, Spanish, and R&B. Free, 7:30–11 pm, 505-982-5511, lafondasantafe.com. Pop and originals with ukulele. Free, 8:30–10:30 pm, 505-984-1193, vanessiesantafe.com. Poet-activist Jimmy Baca immerses the reader in an epic narrative poem, imagining the experience of motherhood in the context of immigration, family separation, and ICE raids on the Southern border. Free, 6 pm, 505-988-4226, collectedworksbookstore.com. The group fashions a stylish take on bluegrass that seamlessly blends original songs and instrumentals with Appalachian old-time music for a truly unique band sound. $22, 7:30 pm, 505-886-1251, gigsantafe.tickit.ca. The intersections between rock, jazz, classical, and world music. $28–$38, 7:30 pm, all ages, 505-886-1251, ampconcerts.org. La Boca Spring Wine Dinner La Boca Taberna, 125 Lincoln Santa Fean NOW Magazine reaches more than 20,000 active Santa Feans and visitors who enjoy the the best Santa Fe offers and reaches prequalified buyers through our exceptional distribution network of print and online readership. Competitively priced with extraordinary, non-newsprint graphic reproduction, NOW puts your business in the best light. Put it to work for you today. Featuring the wines of Galicia and guest sommelier Jason Romero of Albuquerque’s Favorite Brands. $125, 6:30 pm, 505-982-3433, labocasantafe.com. regional, and national businesses related to health care, hospitality, government, retail/ management, law enforcement, and more. Free, 10 am–2 pm, 505-428-1406, sfcc.edu. Los Angeles–based pianist-vocalist who does standards, Broadway, contemporary and pop selections. Free, 6:30–9:30 pm, 505-982-9966, vanessiesantafe.com. A guitarist in The Living Room. Free, 7–10 pm, 505-988-5531, hotelloretto.com. Country, Spanish, and R&B. Free, 7:30–11 pm, 505-982-5511, lafondasantafe.com. Flamenco jazz trio. Free, 7:30–10:30 pm, 505-983-6756, elmeson-santafe.com. Vicki Pozzebon, the owner and principal consultant of consulting firm Prospera Partners, talks about the intersection of business and social change. Free, 8:30–11 am, design-corps.org. Gardens of Beauty: African-American Gardens and Yards in the Rural South Santa Fe Botanical Garden 715 Camino Lejo A lecture covering 600 years of history from pre-colonial Africa to today, dissecting the evolution and elements of this unique art form. Free, 3–4:30 pm, 505-471-9103, santafebotanicalgarden.org. Duo Rasminko Mine Shaft Tavern, 2846 NM-14, Madrid Bohemian pop. Free, 5 pm, 505-473-0743, themineshafttavern.com. Multi-instrumentalist and vocalist. Free, 5–8:30 pm, 800-462-2635, tesuquecasino.com. Tom McGee uses technologies such as 3D printing to explore landcsapes at his 7Arts Gallery show opening April 5. The poems in John Brandi’s new collection, The Great Unrest, illuminate a lifetime of travels. John will be introduced by the Santa Fe poet Renée Gregorio. Free, 6 pm, 505-988-4226, collectedworksbookstore.com. Flute Duos by Telemann and Kuhlau First Presbyterian Church of Santa Fe, 208 Grant Melissa Colgin Abeln and Carol Redman, flutes, and Linda Raney, organ. Free, 5:30 pm, 505-982-8544, fpcsantafe.org. Gregory Horndeski: Vernal Paintings Horndeski Contemporary, LLC, 716 Canyon Horndeski explores spring in a series of lively paintings. Free, 5–8 pm, 505-231-3731, horndeski-contemporary.business.site. Artists and makers Chelsea Call, Casa Brujaja, Virga Studio, and Golden Eagle Thunder bring you mementos of the season: delicate pressed flowers, plant dyed textiles, flower essences, and more. Local singer-songwriter Ziloeta provides entertainment and there is a pop up with the handmade dessert creations of Honey & Thyme. Free, 6–9 pm, 505-820-0847, dandelionguild.com. A space generated by the pure vibration of Tibetan bowls and mantras. The sound of these ancient Himalayan healing instruments can induce a deep meditative state. $20, 7:30–9:30 pm, 505-577-5248, radiancematrix.com. Singers and songwriters. Free, 5:30 pm, 505-471-9271, beercreekbrew.com. Left Bank Second Street Brewery, 1814 Second St Ragtime. Free, 7–10 pm, 505-982-3030, secondstreetbrewery.com. Delta blues. Free, 8 pm, 505-473-0743, themineshafttavern.com. Americana, folk-style songwriting. Free, 8–11 pm, 505-780-5730, tumblerootbreweryanddistillery.com. Jimmy Stadler Band La Fonda on the Plaza, 100 E San Francisco Rock ‘n’ roll. Free, 8–11 pm, 505-982-5511, lafondasantafe.com. Rock, blues, and Americana. Free, 9–11 pm, 505-780-5730, elfarolsantafe.com. Preparing Habitats for Santa Fe Bluebirds Santa Fe Botanical Garden, 715 Camino Lejo In this class, learn to make bluebird houses that have a unique Santa Fe style. $55, 1–4 pm, 505-471-9103, santafebotanicalgarden.org. This retreat is led by Joshin Byrnes and Genzan Quennell and offers the experience of deep periods of uninterrupted meditation. Meditation instruction is offered to beginners. $50, meals included, 6 am–9 pm, 505-986-8518, upaya.org. On April 11, John Reischman and the Jaybirds play original bluegrass tunes at GiG Performance Space. bags, gloves, and T-shirts for participants. Free, 9 am–12 pm, 505-955-2215, keepsantafebeautiful.org. Santa Fe’s best in pottery, jewelry, paintings, photography, sculpture, furniture, textiles, and more. Featuring local juried artists. Free, 9 am–2 pm, 505-310-8766, santafeartistsmarket.com. Featuring violin soloist Renée Hemsing Patten and music by Brahms, Rossini, and Hovhaness. Free, 7 pm, losalamossymphony.org. (See page 1.) Free, 12–5 pm, facebook.com/santafezinefest. The Hungarian band plays their signature instrument, the Hungaro-Serbian tambura. $20–$25, 7:30 pm, all ages, 505-886-1251, ampconcerts.org. In 1919 in St. Francis Auditorium, writer and activist Mary Hunter Austin staged a production of three plays. Her vision ultimately became the foundation for the forming of The Santa Fe Playhouse. $10–$50, 7:30–9:30 pm, 505-476-5072, nmartmuseum.org. Saturday Jazz Collected Works Bookstore & Coffeehouse 202 Galisteo Iconik Downtown presents jazz in the café area. Free, 11 am–1:30 pm, 505-988-4226, collectedworksbookstore.com. Lori Ottino and Erik Sawyer Mine Shaft Tavern, 2846 NM-14, Madrid Singer-songwriters. Free, 3 pm, 505-473-0743, themineshafttavern.com. Psychedelic mutt rock. Free, 5 pm, 505-471-9271, beercreekbrew.com. Singer-songwriter. Free, 5–8:30 pm, 800-462-2635, tesuquecasino.com. Standards, Broadway, contemporary and pop selections. Free, 6:30–9:30 pm, 505-982-9966, vanessiesantafe.com. In order to take your Santa Fean experience to the next level, we have added videos to our website that enhance our editorial content as well as expanded offerings from select advertisers. Make sure to like us on Facebook to see new content, videos, and promotional material. Native American flute and Spanish classical guitar. Free, 7–9 pm, 855-825-9876, hotelsantafe.com, ronaldroybal.com. Son huatesco music. Free, 7–10 pm, 505-982-3030, secondstreetbrewery.com. Alt country. Free, 8 pm, 505-473-0743, themineshafttavern.com. An evening of live, improvised comedy performed by multitalented students from the Quinn Fontaine Studio. Quinn will also teach improvisation techniques in between skits. $12, all ages, 7:30–8:30 pm, 505-395-6369, meowwolf.com. Classic rock. $5, 9–11 pm, 505-780-5730, elfarolsantafe.com. presents a special concert on April 6. Local art, photography, jewelry, ceramics, glasswork, textiles, food, live music, and more every Sunday at the Railyard. Free, 10 am–4 pm, 505-983-4098, artmarketsantafe.com. Global fusion and electronic music. $18–$22, 9 pm–2 am, ages 21+, 505-395-6369, meowwolf.com. Guest conductor Dante Anzolini leads The Santa Fe Symphony Orchestra & Chorus in Mozart’s Symphony No. 29 and Brahms’s Ein deutches Requiem. $22–$80, 4 pm, 505-988-1234, ticketssantafe.org. Rock, blues, Americana, and sass. Free, 10 pm–1 am, 800-462-2635, tesuquecasino.com. New Volunteer Orientation Santa Fe Botanical Garden, 715 Camino Lejo Orientation for new Botanical Garden volunteers. Free, 2–4 pm, 505-471-9103, santafebotanicalgarden.org. Rock ‘n’ roll. Free, 8–11 pm, 505-982-5511, lafondasantafe.com. Brazilian, flamenco, and classical music. Free, 6:30–8:30 pm, 505-982-5511, lafondasantafe.com. A gamelan ensemble. $10–$15, 8 pm, 505-577-5248, earwaves.net. Jazz with Dalton on piano. Free, 11:30 am–3 pm, 800-462-2635, tesuquecasino.com. Blues, roots, rock, and soul. Free, 4 pm, 505-471-9271, beercreekbrew.com. An art therapy–inspired workshop cultivating self-care at the David Loughridge Learning Center. $15, ages 18+, 5:30–7:30 pm, 505-395-6369, meowwolf.com. Electronic and hip-hop. Guest acts are Buku, Huxley Anne, and Eazybaked. $18–$22, 7 pm–midnight, ages 18+, 505-395-6369, meowwolf.com. The writers read and discuss their work. $5–$8, 7 pm, 505-988-1234, ticketssantafe.org. Impasse by Sally Chiu will be interpreted poetically at ViVO on April 5. Luci Tapahonso, the inaugural Poet Laureate of the Navajo Nation, is the author of three children’s books and six books of poetry. Her work honors the rich legacy of the Diné people. In her poetry, Layli Long Soldier reflects on her own legacy and heritage as a citizen of the Oglala Lakota Nation. Free, 6 pm, 505-988-4226, collectedworksbookstore.com. A multi-day Zen meditation retreat. Joshin Byrnes and Genzan Quennell employ the teachings from the Lotus Sutra as the theme for practice. $540 includes meals and lodging, 505-982-9261, upaya.org. Funk and soul. Free, 7:30–11 pm, 505-982-5511, lafondasantafe.com. Discover Santa Fe via Historic Walks of Santa Fe, historicwalksofsantafe.com; Get Acquainted Walking Tour, 505-983-7774; Discovery Walking Tours, 505-577-7645, sfdiscoverytour.wix.com/downtown; Walking Tours of Historic Downtown, 505-476-5200, santafewalkingtour. org; A Well-Born Guide, swguides.com; Santa Fe Art Tours, santafearttours.com; or the New Mexico Museum of Art, nmartmuseum.org. A pub trivia quiz covering everything from celebrities in trouble to wordplay to bad television. Free, 8 pm, 505-989-3278, secondstreetbrewery.com. To have your event listed in the calendar section of NOW, please either email your information and any related photos to calendar@santafean.com or self-post your event at santafeanNOW.com. All material must be emailed or self-posted two weeks prior to NOW’s Thursday publication date. All submissions are welcome, but events will be included in NOW as space allows. Above: Harrison Begay, untitled ceremonial scene, watercolor on paper, 19 x 31"
PREVIEWS Left: PAZ, The Creation and Destruction of Civilization, mixed media on handcarved wood panel, 14 x 24"
Below: Tom McGee, San Jose Reimagined, acrylic on 3-D print, 12 x 12"